Sun Yat-sen, the Founding Father of modern China, the Republic of China (Nationalist China) and the forerunner of democratic revolution in the People’s Republic of China, was born November 12, 1866, to an ordinary farmer’s family in Cuiheng Village, Xiangshan, in the south of the Pearl River Delta of the South China province of Guangdong. In Sun Yat-sen’s four years in Hawai’i (1879-1883), he is said to have attended three Christian educational institutions: ʻIolani College, Oʻahu College (Punahou School) and St Louis College. He came to Hawaiʻi on six different occasions, initially for schooling and to support his brother’s businesses on Maui. Later, his trips were geared to gain support for revolutionizing China and fundraising for that end. The place of his birth, previously known as Xiāngshān, had been renamed Zhōngshān – Sun Yat-sen was known in Chinese as Sun Zhongshan. Sun needed to travel to get backing for his revolutionary plans, as well as raise funds to support it. With the US Chinese Exclusion Act (1882) severely limiting Chinese immigration, Sun had difficulty entering the US and was even detained by US authorities at one point. Sun’s detention prompted an overseas Chinese to say that if Sun wanted to promote a Chinese revolution on US soil, it would be best if he had US citizenship. In 1900, the Hawaiian Organic Act was passed stating that any person that was a citizen of the Republic of Hawaiʻi on or before August 12, 1898 would also become a citizen of the United States. As a “citizen of Hawaiʻi” Sun could travel to the US continent in the early-1900s to rally both support and funds for his revolutionary efforts. When the birth certificate was no longer needed, he renounced it. The revolutionary movement in China grew stronger and stronger. Tung Meng Hui members staged many armed uprisings, culminating in the October 10, 1911 Wuhan (Wuchang) Uprising which succeeded in overthrowing the Manchu dynasty and established the Republic of China. 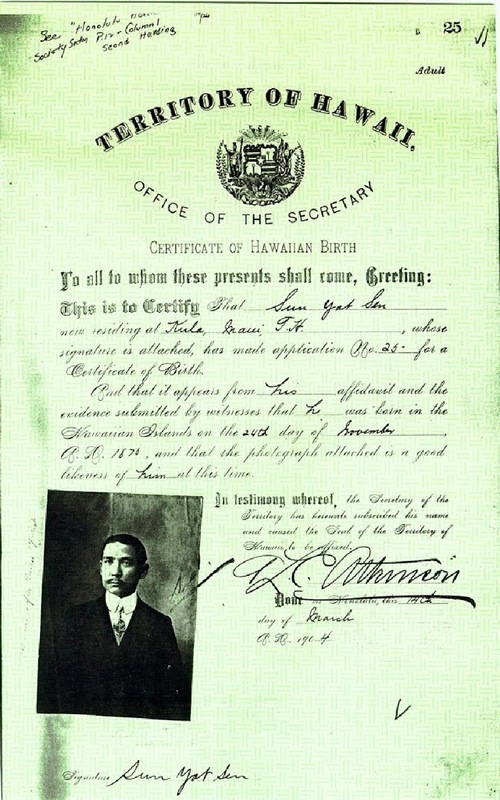 The image shows Sun Yat-sen’s Hawaiian Birth certificate. In addition, I have included other images in a folder of like name in the Photos section on my Facebook and Google+ pages. Sun Yat-sen is the Founding Father of modern China, the Republic of China (Nationalist China) and the forerunner of democratic revolution in the People’s Republic of China. The Qing Dynasty, also Empire of the Great Qing or Great Qing, was the last imperial dynasty of China, ruling from 1644 to 1912 with a brief, abortive restoration in 1917. After the outbreak of the Xinhai Revolution on October 10, 1911, revolutionary leader Sun Yat-sen (November 12, 1866 –March 12, 1925) was elected Provisional President and founded the Provisional Government of the Republic of China. Sun Yat-sen was born to an ordinary farmer’s family in Cuiheng Village, Xiangshan, the South China province of Guangdong. 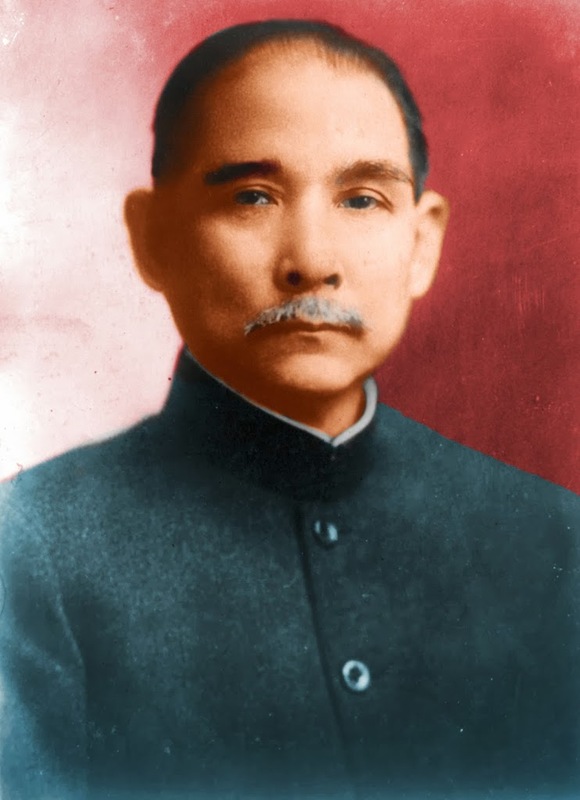 In Sun Yat-sen’s four years in Hawai’i (1879-1883), he is said to have attended three Christian educational institutions: ʻIolani College, St Louis College and Oʻahu College (Punahou School.) Then, he was called Tai Cheong or Tai Chu. In 1883, Sun registered in the Punahou Preparatory School, one of the fifty children who studied in the two classrooms upstairs in the school building. He was listed as Tai Chu, he was one of three Chinese students, the others being Chung Lee and Hong Tong. Sun was also influenced by the Anglican and Protestant Christian religious teachings he received; he was later baptized. On another visit to Hawaiʻi (in 1903,) Sun reorganized the Hsing Chung Hui into Chung Hua Ke Min Jun (The Chinese Revolutionary Army) in Hilo. In 1905, in Tokyo, Sun reorganized the Hsing Chung Hui and other organizations into a political party called the Tung Meng Hui. Likewise, the Chinese Revolutionary Army was reorganized and all of its members Tung Meng Hui members. This party spread all over China and rallied all the revolutionists under its wings. He then made his last visit to Hawaiʻi to form the Hawaiʻi Chapter of Tung Meng Hui. The Republic of China governed mainland China until 1949; in that year, during the Chinese Civil War, the communists captured Beijing and later Nanjing. The communist-party-led People’s Republic of China was proclaimed on October 1, 1949. Hawaiʻi and its people played an important role in the life of Sun Yat-sen as well as in his revolutionary activities. His first revolutionary organization was formed in Hawaiʻi, it developed into the political party directly responsible for the collapse of the Manchus. Another Hawaiʻi tie for Sun relates to the Chinese Exclusion Act of 1882 that blocked Chinese travel to the US. He used it to travel to the continent; then, when it was no longer needed, he renounced it.